Convert Blind To Theater Screen? 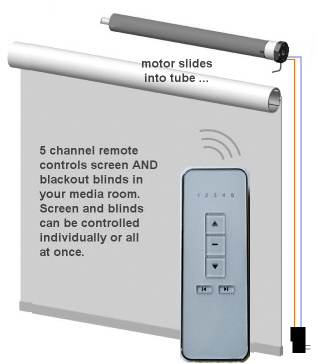 FAQ: Can I make a remote control home theater screen from an Ikea® blind? We are often asked about using our motors to retrofit ordinary roller blinds and shades from retail outlets like Ikea® and Home Depot®. Many people also ask if it is possible to make a remote control home theater projection screen out of an ordinary blind. The short answer is 'yes you can'. Read on to hear how one of our customers in France (Hervé C.) used our 'Mini' motor to convert an ordinary Tupplur roller shade (about $35) from Ikea® into a motorized home theater projection screen. It could work with the Enje model too. If you are interested in making a larger retractable projection screen, you may also want to read this article about using our remote control motors to make a large projector screen. Hervé had used a video projector in his home for a few years, using a white wall to project the image onto. He decide to deploy our Mini roller shade motor as a DIY (Do It Yourself) project to convert the TUPPLUR blackout blind into a remote control retractable projector screen. Since our motors use low voltage DC power (12 volts), they are a very safe choice for DIY blind automation projects as the system will not harm children or adults, even if they accidentally touch hot wires that are powering the motor. Using an Ikea® roller blind as a projection screen is not a new thing. As Hervé points out, many people have discussed this soluton here and there on the internet as a very inexpensive solution for those that need an affordable projector screen. His twist on it was to add the motor and remote control system. Hervé already had a home automation system, and he did not want to use our built-in radio tubular motors with a dedicated multi-channel remote control, although that would have been easier. So he opted for our Universal Motor Interface for home automation product to control one of our non-radio Mini tubular motors (which is small enough to fit inside the Tupplur tube). This project is also a good example of how you could use our Vera home automation controller. The Vera system is about choice, budget & versatility: it can be operated by any web enabled device via the browser (smartphones, tablets, laptops, desktops) and any operating system (Windows®, Apple®, Linux®, B2G, Android®, Tizen®, IOS®, etc). It can also control various different device protocols, such as Z-Wave®, Insteon®, and x10®. It can be customized to support any device with the Lua scripting language, although the built-in user-friendly interface can set up 'scenes' to do almost anything. Our Universal Motor Interface is a compact, inexpensive DC motor controller that can connect our reversible non-radio motors to any home automation system, and it is capable of running up to 10 blinds simultaneously, depending on the size.